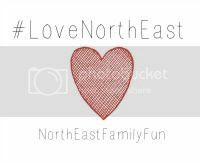 Welcome to Love North East for August - the place to link up your favourite North East blog posts, discover new blogs and hidden gems. I've had a quick peek and I started this linky in October 2-14 after the NEblogger awards - I am so proud that it is still going strong and really appreciate everyone who joins in. Talking of the NEblogger awards, if you aren't sure who to nominate I am sure the blogs that link up in this linky may give you some inspiration - or why not nominate yourself here:- http://www.nebloggerawards.co.uk/ It really doesn't matter how big/small your blog is - all NEbloggers are welcome to take part. Last month I loved My Northumberland Vancation from Life in Geordieland, The North East Chilli Festival from All About Eats and Newcastle Restaurant Week from Chow At Home.